Tregoyd /Cadarn Holidays01497 847351work BunkhouseCadarn Bunkhouse is situated in foothills of the Black Mountains near Hay-on-Wye and is close to the Brecon Beacons. Originally a small Welsh hill farm, Cadarn is in a secluded setting almost at the end of a no-through road - but only a ten minute walk to a friendly local pub. 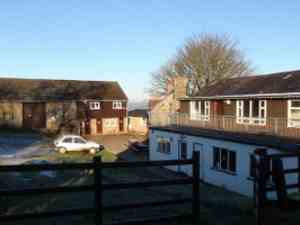 Direct access out onto the mountains makes this an ideal base for walking and riding groups. Cadarn Bunkhouse is situated in foothills of the Black Mountains near Hay-on-Wye and is close to the Brecon Beacons. Originally a small Welsh hill farm, Cadarn is in a secluded setting almost at the end of a no-through road - but only a ten minute walk to a friendly local pub. Direct access out onto the mountains makes this an ideal base for walking and riding groups. The bunkhouse sleeps up to 50 in seven bunk rooms, split into two separate blocks making it suitable for small or large groups. There is a male and female shower/toilet block shared between both units. In addition there is a bungalow with four twin bedded rooms with their own shower/toilet facilities for those seeking more privacy.